As well as social media and content writing services, Red Desk also offer SEO for small businesses. SEO incorporates many areas that all need to be working and optimized to ensure your business is being found online. We offer a tailor made SEO plan that best reflects the needs of the client’s business. This could be a one off review, an ongoing strategy or a specific campaign. We take a look at Google Analytics to see where your website’s traffic is coming from. We can also gather data on your audience (location, optimum search times) and assess your website’s functionality. Keywords are a vital part of SEO for your website but will also feed into a definitive list of hashtags for particular use on Instagram and Twitter. Keywords and search terms are picked up by search engines to match up websites and online searches. 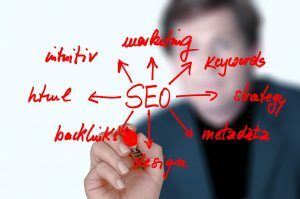 We use a variety of tools to find the best keywords for your website and SEO campaign including Google’s keyword planner and www.keyhole.co. Hashtags can be specifically picked to help identify your brand or support your marketing campaign. Take a look at our article on our social media training session with Islington Youth Council for how keywords and hashtags were developed for their campaign. If you have a WordPress website then we advise you install and use Yoast which is a free plugin which helps analyse your webpages and posts’ SEO. With the help of Yoast and our keywords list, we can optimise your website by adding tags, keywords to your pages and tweaking the content. We will also check the page speeds and website functionality. Do take a look at our basic guide to SEO. If you have social media, we will check that the accounts are fully optimised and link correctly to your website. Social media is an important part of pulling traffic to your website organically and shouldn’t be overlooked. We will review your Google Local entry as this can be the first place a potential customer comes even before the website. You can read more information on Google Local here. We can set up, run and monitor Google Ads campaigns on your behalf. We have worked with clients who have a small campaign running daily, and others who run larger scale campaigns at certain times of the year.